If you're looking for a shorter length and extra height, the HD-7P is for you; its compact convenience is perfect when you want the lifting power of a BendPak four-post lift in a tight space. The BendPak HD-9 is a rugged, 9,000-lb. 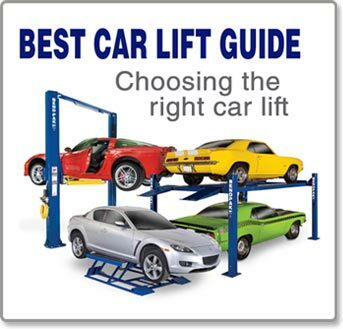 4-post car lift that is the perfect lifting solution. 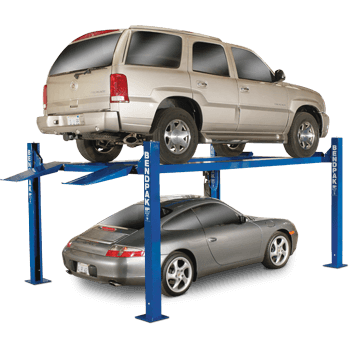 Great for vehicle storage and service at the shop or in the home garage.Whether you’re a service professional or a DIY’er, BendPak’s got the right car hoist for you. This model is available with optional casters, dip-trays, jack platform and more. The HD-9XW is a 9,000-lb. 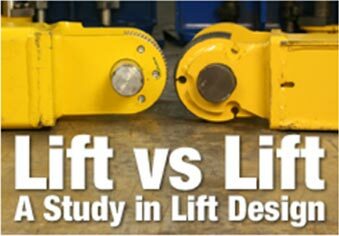 rugged lifting solution if you need get something heavy up high, but you don’t have an entire garage to dedicate to the lift. Perfect for vehicle storage and service—at the shop or in the garage. Whether you're a service professional or a DIY'er, BendPak's got the right lift for you. This model is available with optional casters, dip-trays, jack platform and more. The HD-9ST is a rugged, standard-height, space-saver solution with a 9,000-lb. lifting capacity. Perfect for vehicle storage and service—at the shop or in the garage. Whether you're a service professional or a DIY'er, BendPak's got the right lift for you. This model is available with optional casters, dip-trays, jack platform and more. The HD-9STX is your 9,000-lb. rugged lifting solution if you need get something heavy up high, but you don't have a lot of space on the ground to lift it with. Perfect for vehicle storage and service—at the shop or in the garage. Whether you're a service professional or a DIY'er, BendPak’s got the right car lift for you. This model is available with optional casters, dip-trays, jack platform and more. 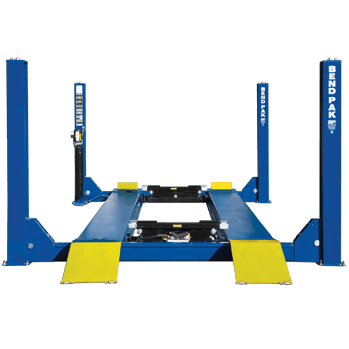 The BendPak HD-9SW Four Post Lift has a 9,000 pound capacity and is super wide which makes it the ideal double storage and service solution. 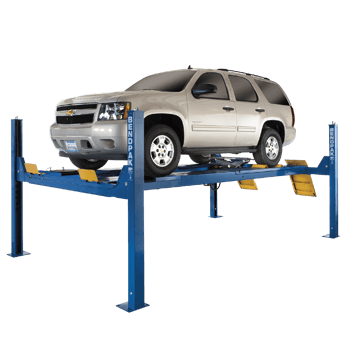 This 4 post lift works equally well in the service shop and at home. The super-wide design allows this car hoist to raise and store two vehicles simultaneously on four runways. 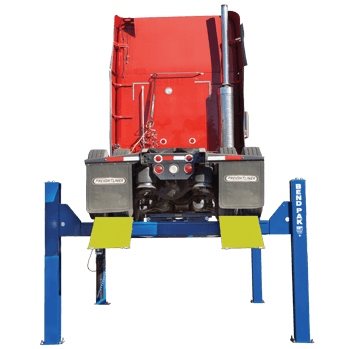 The HD-9XL is BendPak’s 9,000 pound lifting capacity four post lift with a standard lifting height and long runways to accommodate cars and longer trucks. 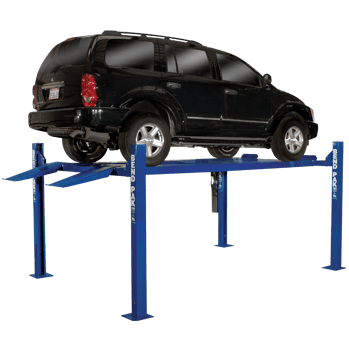 BendPak four post lifts are perfect for the garage or shop use or professional use. Whether you're a service professional or a DIY'er, BendPak's got the right lift for you. This hoist model is available with optional casters, dip-trays, jack platform and more. The HD-9SWX is a tandem, high-rise lift that acts as double-vehicle storage and service solution. Store two vehicles on four runways. Available with casters, drip-trays, jack platform and more. The BendPak HDS‐14 four‐post lift is newly engineered and built to last, and feature upgrades that increase safety, durability and productivity. Designed into every HDS-Series lift is a laundry list of key features as long as your arm to ensure that BendPak is the absolute best you can buy. The HDS-14X is BendPak’s 14,000 pound capacity 4-post lift with extra-long runways. 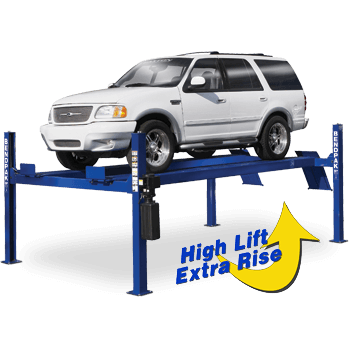 This four post lift is designed specifically for servicing low-profile vehicles and extra-long limousine fleets. 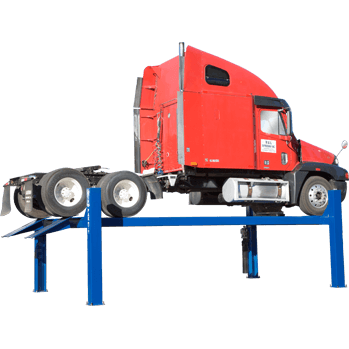 Newly engineered car and truck lifts that work better, are built to last, and feature upgrades that increase safety, durability and productivity. The HDSO-14 is a legendary 14,000-lb. capacity open-front hoist. This is an open front-model that allows easy entry and exit from beneath a vehicle. It is available with optional drive-thru ramps, dip-trays and rolling jacks. We love our hoists and you will too. 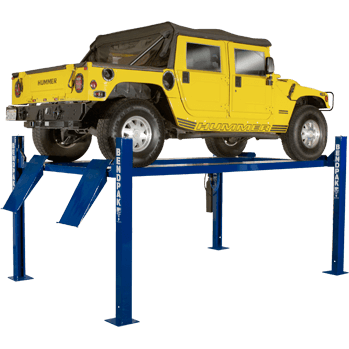 The HD-14TL is a full-sized four-post lift designed with 12" of added lifting height for added headroom or for parking higher-profile vehicles beneath the raised platform. With this four-post car hoist, you can push 14,000 pounds worth of automobile into the air without breaking a sweat. This model is available with optional drive-thru ramps, drip-trays and 7,000-lb. capacity rolling jacks. 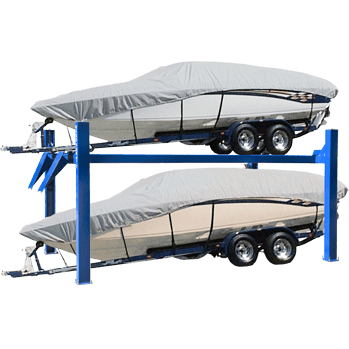 Avoid rust, blemishes, rot, cold damage and more with BendPak's longer HD-7500BLX boat storage solution--the safest, most cost-effective way to dry dock your boat. This is the 18,000 pound four-post heavy duty truck lift. 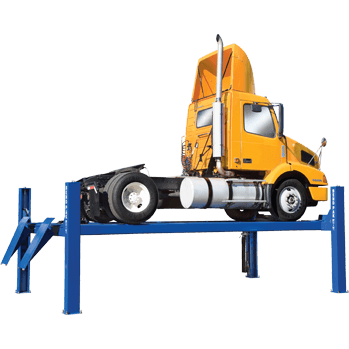 Our heavy-duty four-post truck hoists are massive truck lifts that bring a higher level of service to your garage or shop. BendPak's HDS-27 heavy-duty four-post truck lift features bigger sheaves, beefier components and a legacy of dependability. 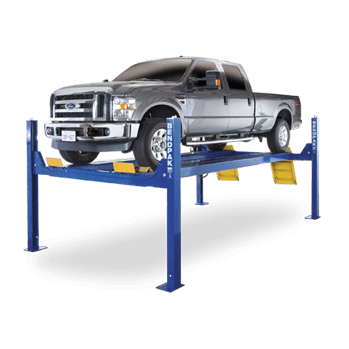 Get your hands on this rugged truck lift and bring a higher level of service to your garage or shop. BendPak's newest line of heavy-duty four-post truck hoists are here. Bigger sheaves, beefier components and a legacy of dependability--get your hands on these massive machines and bring a higher level of service to your garage or shop. 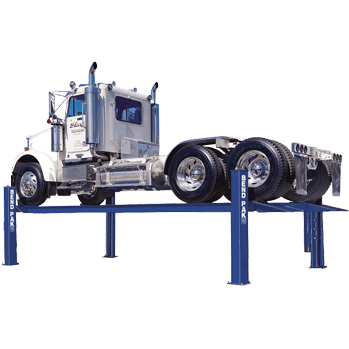 The HDS-40 is a super-duty 4-post truck lift designed for truck fleet service operations. The HDS-40 has a 40,000 pound lifting capacity and is one of the largest heavy-duty four post hoists in its class. 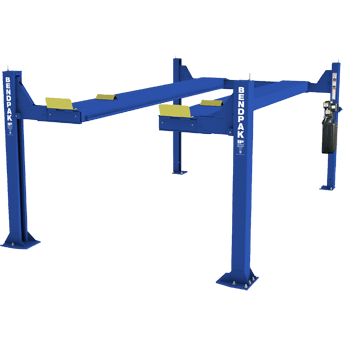 BendPak’s 4 post lifts are specifically designed for commercial use. 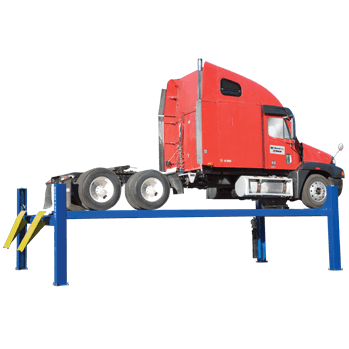 The HDS-40X is an extended length, super-duty 4-post truck lift designed for truck fleet service operations. The HDS-40 has a 40,000 pound lifting capacity and is one of the largest heavy-duty four post hoists in its class. 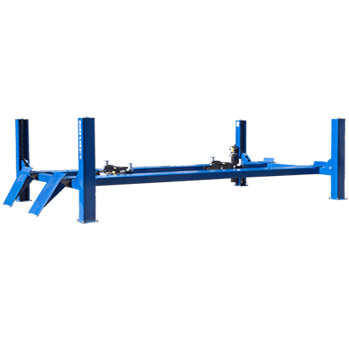 BendPak’s 4 post lifts are specifically designed for commercial use. BendPak HD-Series and HDS-Series 4-Post car lifts are made with best materials, technology and safety, with exclusive features that you'll wonder how you ever lived without. 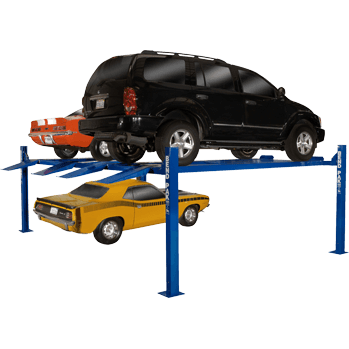 Favored both by professional automotive garages and dedicated DIY'ers for home garage parking and carports, BendPak four-post lifts are optimized for performance, featuring unprecedented safety and control, advanced hydraulic systems for enhanced productivity and extended operation even when used for the most demanding applications. BendPak's HD-Series and HDS-Series 4-Post lifts are engineered to meet the strenuous demands of any lifting job. Capacities range from 7,000 lbs. to a super-duty 40,000-lb. maximum. If it drives, one of our HD-Series and HDS-Series 4-Posts can probably lift it. These lifts also pull double-duty as convenient garage parking and storage solutions. All BendPak lifts are backed by 45 years of excellence and a reputation that carries as much weight as the lift itself. 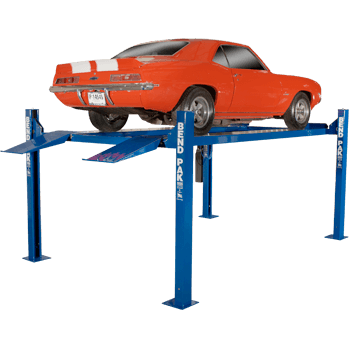 We're proud to have these HD and HDS-Series car lifts in our lineup, and you'll be proud to have one in your shop or garage.